Last night the “Howlin’ For Hubert’ concert took place at the legendary Apollo Theatre in New York. Hubert Sumlin, known for his years backing blues legend Howlin’ Wolf, died on December 4th at the age of 80. Eric Clapton, Keith Richards, ZZ Top’s Billy Gibbons, Elvis Costello, Jimmie Vaughan, Buddy Guy, Warren Haynes, Derek Trucks, Robert Randolph, Kenny Wayne Shepherd, Jimmy Vivino and many, many others were there to pay tribute to the late blues guitarist. 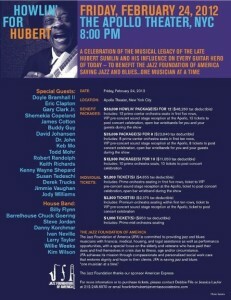 The show was a benefit for the Jazz Foundation of America. Followed by musicians from Big Head Todd, David Johansen, Billy Gibbons, and Warren Haynes to some terrific old Chicago blues guys. Wow… the solo on “Going Down Slow” just blew me away….. Amazing!